Welcome to all serious newcomers who have questioned the events of 9/11, and never knew where to look for answers. These classes are dedicated to all of you. The first class will be taught by me, and it will take place on Friday, 3/31/2006 at 8pm EST. I will be out of pocket this weekend, so SBG will be pulling his weight around here. Also, someone had requested I set up a PO Box for anonymous donations, you can find that on the left panel now. Lots of stuff going on today - Open thread, have at it! THE VICE PRESIDENT: That's correct. We had one report early on from another intelligence service that suggested that the lead hijacker, Mohamed Atta, had met with Iraqi intelligence officials in Prague, Czechoslovakia. And that reporting waxed and waned where the degree of confidence in it, and so forth, has been pretty well knocked down now at this stage, that that meeting ever took place. So we've never made the case, or argued the case that somehow Osama bin Laden [sic] was directly involved in 9/11. That evidence has never been forthcoming. But there -- that's a separate proposition from the question of whether or not there was some kind of a relationship between the Iraqi government, Iraqi intelligence services and the al Qaeda organization. If you missed Dr. David Ray Griffin's speech tonight you really missed out. We have the audio of his presentation available for download though, so check it out and get up to speed. Special thanks to Yarrow from gunsandbutter.net for getting the MP3 to us so quickly, and to all the people who made this event happen! When asked what the most compelling facts are to make the case that the U.S. government was complicit in the attacks, Griffin names three things. The behavior of Bush at the schoolhouse in Florida ("Secret Service should have whisked him out immediately if we're under attack but he stayed over 30 minutes. ... It's pretty clear evidence that they knew they wouldn't be attacked"), the strange pyrotechnics that brought down the World Trade Center ("fire has never brought down a steel high-rise building") and the poorly planned targeting of the West Wing of the White House ("all the important people are in the East Wing -- it doesn't make any sense"). Michel Chossudovsky, Paul Thompson, Nafeez Ahmed, Mike Ruppert, Dan Hopsicker; these are the people who were front and center with credible, original, and groundbreaking research and investigation in the months following the attacks of September 11th. For the next three years, almost every major, incontrovertible piece of evidence showing government complicity in the attacks originated from this group. Add to this list David Ray Griffin, the late-comer author of two excellent books deconstructing the US government's 'explanation' of the attacks, and you have encompassed five of the best-selling books about 9/11 - books which thoroughly and reliably discredit the US government. It is also from these scholars, investigative journalists, and researchers that almost every now-standard, unanswered issue debunking the government's position originated. 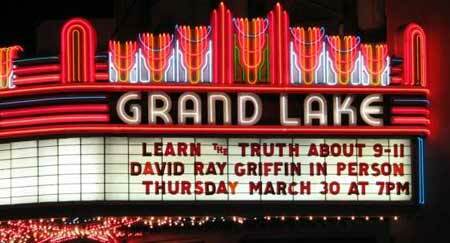 Dr. Griffin is about to start his presentation entitled 9/11 - The Myth & The Reality out in Oakland, California. You can listen to his presentation via a live stream at kmud.org. This would be a great opportunity for newcomers and others to hear some of the many points of contention surrounding 9/11 from a well rounded professor emeritus of philosophy and theology. Speaking to The Alex Jones Show Asner, best known for his Emmy-winning role as Lou Grant on The Mary Tyler Moore Show, echoed Charlie Sheen's sentiments in stating, "I became suspicious of 9/11 on the day it happened." "I will always be that suspect of it and challenge it and challenge various points of it," said Asner. Asner agreed that the official story of 9/11 and the Kean Commission investigation was a fable and a fraud. "I do not buy it and I would challenge it, I know all of these points....the standing down," said Asner. Asner questioned why no authority figures had been fired for their inability to prevent 9/11. "Nobody in high office has ever paid the penalty for keeping us unprepared for 9/11, no one has paid the price and I cite the fact that Abu Ghraib was another typical example of the way this government works," said Asner. A dozen firemen, a civilian, and a police officer, who were on Stairway B between floors 1 and 6, survived the collapse of the 110-floor north World Trade Center tower on September 11, 2001. Their story is documented in the book Report from Ground Zero: The Story of the Rescue Efforts at the World Trade Center by Dennis Smith, which contains testimonies of several of the survivors from this pocket of life in a tower that plummeted to destruction. Shankar Nair, whose statement quoted above is quite telling, was one of those "experts" on whom the government depended to support what turned out to be an ever-changing, but always flimsy, story. Many of the scientists involved in the investigation were asked to examine ancillary issues, like escape routes and other emergency response factors. But those few who attempted to explain what really needed explaining, the unique events of fire-induced collapse, appear to have engaged in what can only be called anti-science. That is, they started with their conclusions and worked backward to some "leading hypotheses."